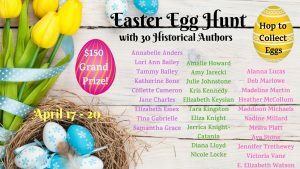 Welcome to the Historical Authors’ Easter Egg Hunt, where you can hop to all the various author sites, collect the lovely eggs from each author, and enter to win a $150 gift card! For those of you who don’t know me, I’m the author of several books, including the #1 bestseller BLOODSPELL and the IPPY award winning BLOODCRAFT in my witch/vampire series; WATERFELL, OCEANBORN, and SEAMONSTER in my twist-on-mermaids series; THE ALMOST GIRL and THE FALLEN PRINCE in my parallel universe science fiction series; and the Spring 2014 Kids’ Indie Next Pick ALPHA GODDESS and DARK GODDESS in my Hindu mythology series. I am also the co-author of the steamy, #1 bestselling historical romance series: the LORDS OF ESSEX and the TARTANS & TITANS series. I’m so excited to have you here with me today. So now, try to find my gorgeous little easter egg (hint: scroll down a bit and check out my historical romance books up for GIVEAWAY)! Then, match the egg to the author by 1) drawing a line between them, or 2) writing the author’s name next to their egg, or 3) writing the number of the egg next to the author’s name. While you are in-between authors hopping to collect eggs, don’t forget to enter my personal contest below to win one of two signed paperback copies of your choice from any of the LORDS OF ESSEX or the TARTANS & TITANS series. Contest is international. When you’re ready to hop to the next author in your list, click on any of the links below to find more eggs, or head on over to the Event Facebook Page for more information and updates! While you are hopping to collect eggs, don’t forget to like, follow, or sign up for the author’s newsletter to keep up to date on their new releases and author wanderings. Thanks for hopping!